"Finally, a resource....guide...roadmap....to help team members and team leaders alike understand what it takes to function as a high performing team, how doing so can personally enrich your life, and why it's critical for organizations to function only in this way. The Emotionally Intelligent Team connects the dots between the task at hand, achieving and making a difference, and personal happiness. Imagine where humankind would be if every entity on the planet operated within a series of high performing teams. Marcia Hughes and James Terrell show us that it's possible!" "We value teams at Medtronic so we know that this book will be a powerful tool in understanding and developing successful team behaviors!" "Marcia Hughes' and James Terrell's latest book, The Emotionally Intelligent Team, is a 'must read' for every school district, business and organization that wants to ensure high functioning and productive teams. Based on solid research, this easy-to-read book describes the seven social emotional skills necessary for effective teams, and includes practical strategies any team leader can use to develop and maintain an emotionally intelligent team. Marcia's and James' book has been of tremendous value to the work of the senior administrative team in our school district!" "Marcia and James provide a good lens for the way people view others in a team environment. This insight, when combined with measuring one’s own EQ through a test such as the Emotional Quotient inventory (EQ-i ®), provides a powerful lever for improving team performance." "Discovering ways to strengthen teams in an organization can lead to impressive improvement in morale, engagement, productivity, and results. The Emotionally Intelligent Team will help any team take practical steps toward greater collaboration and effectiveness." "The most important issue in our networked world is teamwork across levels and boundaries. This masterful work offers a completely new perspective, bringing the power of emotional and social intelligence through engaging insights, exercises and stories to high performance teamwork - creating the opportunity for potentially extraordinary results that are seamless, dynamic, and productive." 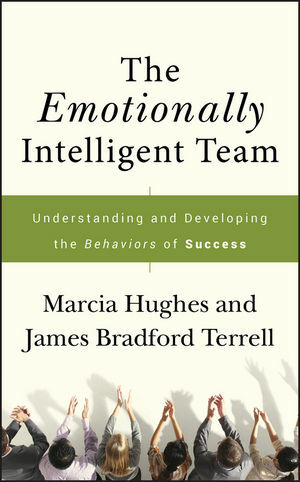 In this compelling book, authors Marcia Hughes and James Terrell offer practical information and a guide for businesses that want to draw on the power of the emotional competencies of their teams. They reveal how individuals, team members, and leaders can take the steps to become more emotionally intelligent team (ESI) members and show how to put in place the practices and exercises that will help any team grow in emotional intelligence. The book outlines the seven emotional competencies of teams. MARCIA HUGHES is president of Collaborative Growth, L.L.C.,a firms pecializing in emotional intelligence, leadership and team development, and conflict resolution, through keynotes, training, executive coaching, and strategic design. JAMES TERRELL, her partner, develops EI applications and coaches individuals, teams in transition, and senior management in anticipating change and responding to it resiliently. The Emotionally Intelligent Team Learn more about how Marcia Hughes helps organizations build emotionally intelligent teams, emotionally intelligent leaders, and develop employees who want to follow their leaders . . . and produce results! The Emotionally Intelligent Team Marcia Hughes and James Terrell offer you more information on their consulting practice, the TESI, articles, media, and more at this website based on the new book!